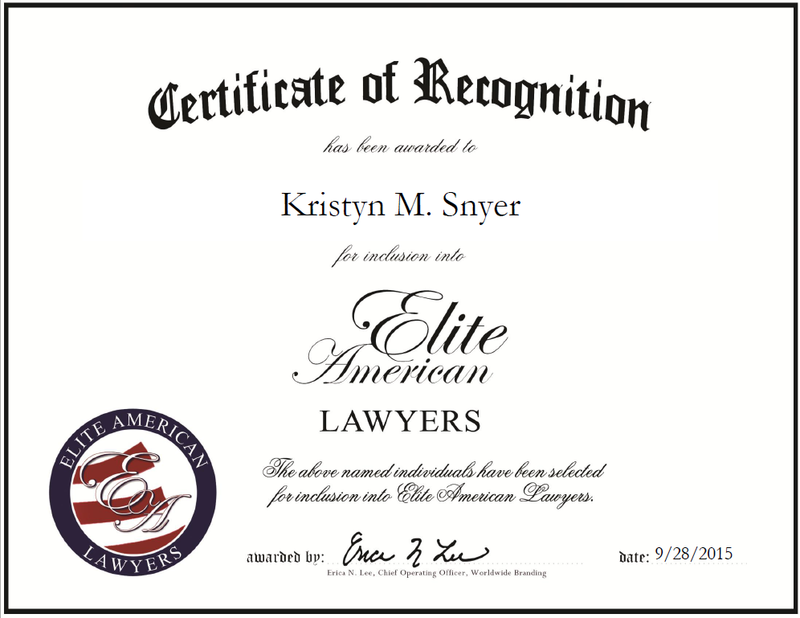 Chelmsford, Massachusetts, September 28, 2015, Kristyn M. Snyer, Attorney of the Law Office of Kristyn Snyer McKenna, has been recognized by Elite American Lawyers, for dedication, achievement and leadership in family law. Ms. Snyer has 20 years of experience as an attorney in the areas of juvenile and family law, as well as special education appeals. Each day, she focuses on child custody, visitation, adoption and guardianship. Looking back, Ms. Snyer attributes her success to her hard work. She became involved in her profession because she always wanted to help and represent children. The highlight of her career has been her ability to help her clients over the past 20 years. Ms. Snyer received a JD from Suffolk University Law School, and a Bachelor of Arts from the College of the Holy Cross in 1993. She maintains affiliation with the Juvenile Justice Center of the American Bar Association, the American Academy of Criminal Defense Attorneys, the Greater Lowell Bar Association and the Juvenile Bar Association of MA. In the near future, Ms. Snyer hopes to become a judge. This entry was posted in Family Law and tagged adoption, adoption law, child custody, child representation, family law, guardianship, juvenile law. Bookmark the permalink.